I’m in Geneva, Switzerland! I have finally begun the Europe trip that I have been planning for MONTHS and it’s so exciting! Photos can be seen if you CLICK HERE! Okay, here we go, Switzerland! I woke up pretty early, probably due to excitement, to finish packing everything for my trip! I just had to gather a few things and I was ready to go! The cab picked me up about 20 minutes earlier than I had scheduled it, but I headed downstairs and gave Amy a big hug goodbye. The cab driver was very nice (I seem to be having luck lately), but he asked me why I scheduled a cab ride for 9:49am. I said I scheduled it for 9:50am. We had a good laugh, as he thought I might have been someone who plans their days by the minute. That would definitely not be me. I arrived at the airport and found out that the airline, EasyJet, only allowed one piece of hand luggage. I was confused, seeing as I only had a backpack and purse. Apparently I had to choose between the backpack OR the purse, not both, as I was usually accustomed to. I lied and said I could fit them into each other, but the lady said i could also hide one of the bags in a duty free bag. I like when people are nice. I got there a bit earlier than Deborah, as her train was late, so I sat in the terminal after getting through security and wrote that last blog post. When Deborah got through everything, we got some Aroma for lunch and headed to the gate. I unfortunately had a middle seat, but it was only a 4-hour flight. I ended up sitting between 2 people who basically did nothing the entire flight. I felt like I was in a “Seinfeld” episode. I’m sure you all know the one I’m thinking of. We finally landed in Geneva after some crazy turbulence, and the flight attendants opened both the front and back doors. I felt an extreme chill throughout the cabin. It. Was. Cold. I put on a jacket, my coat, a scarf, gloves, AND a hat. 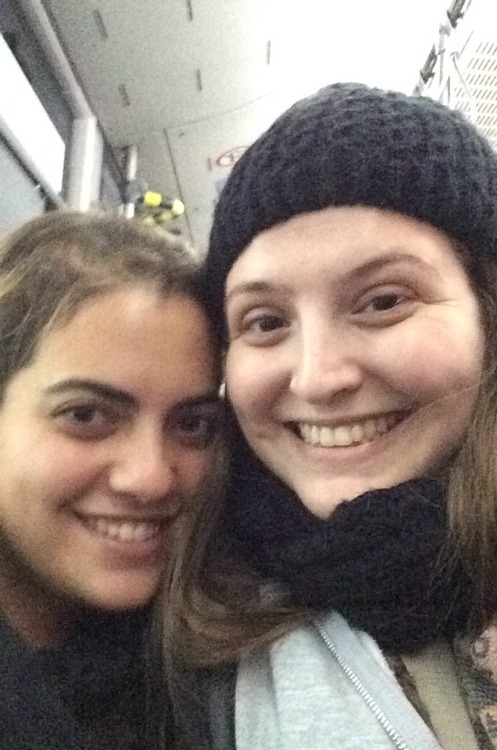 Coming from Tel Aviv, I was definitely not used to the chilly weather. We easily made it through passport control and got our luggage quickly. Gotta love smaller airports, am I right? Deborah’s dad, Elias, greeted us with the traditional Swiss “3 cheek kisses” and drove us back to their home. As we drove through the city, I marveled at it’s beauty and how it honestly felt like a fairytale. The buildings were gorgeous, and there was still a little bit of snow around, which made it so picturesque. I can’t wait to tour around the next day! Elias made us a really delicious Shabbat dinner! It was the first one I’d had in a while, and it is always a nice thing to realize that Judaism around the globe is all connected. Deborah’s middle sister, Alex, joined us, as she was the only one of Deborah’s siblings in town this weekend. She was sweet, but hardly spoke English. Deborah had to do some translating, as my French is completely nonexistent. Hopefully I pick up a few phrases while I’m here! At dinner, I tried bone marrow for the first time (very interesting) and there was a yummy chicken curry with rice, a typical Shabbat dish for Deborah and her family. After dinner, I headed off to bed, not realizing how exhausted the day had made me. 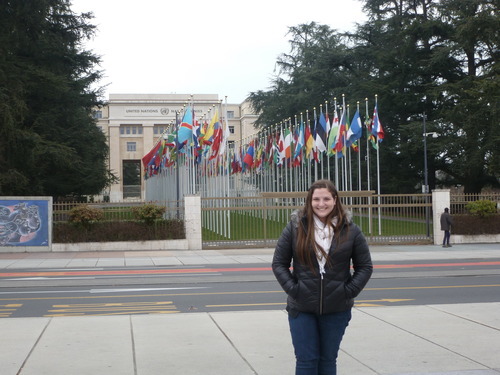 My first full day in Geneva! I had a pretty late start to the day, as both Deborah and I were recovering from packing and flying. Deborah and Elias showed me all around Geneva today. We first stopped at a friend of theirs to drop off some things. 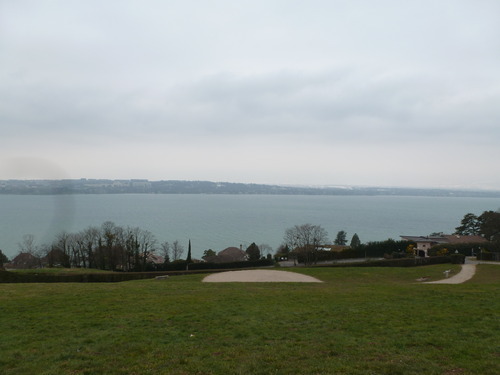 Luckily, there was a beautiful view of Lake Geneva, which I obviously captured on camera. It was very overcast today, but I’m sure that the lake looks even more beautiful in the summer! We spent a little more time at their friend’s house, one of the nicest and biggest houses I’ve ever seen! Apparently the father of the family sold his business for hundreds of millions, so why not spend it on a huge Geneva mansion? I thought it might be awkward to take pictures of the house, but trust me, it was amazing. Definitely rivals any LA mansion I’ve seen. Afterwards, Elias drove us around Geneva, explaining a bit about the buildings and a little bit of the history. It was really interesting! Of course, we had to stop by the UN building. My feelings of the organization aside, it was very cool to see the building lined with all of the flags. 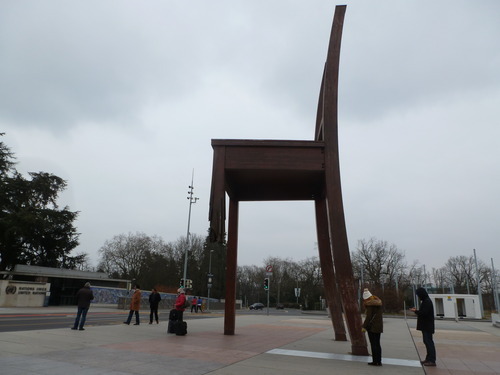 In front of the U.N. building, there is a statue of a chair with a broken leg. Not exactly sure what it symbolizes, but it’s pretty interesting. Next, we headed to the city center. We found a great parking spot and set out to brace the cold. I was fully prepped in 3 layers, a scarf, hat, and gloves once again. I also wore some wool socks that my mom gave me. Thanks, mom! 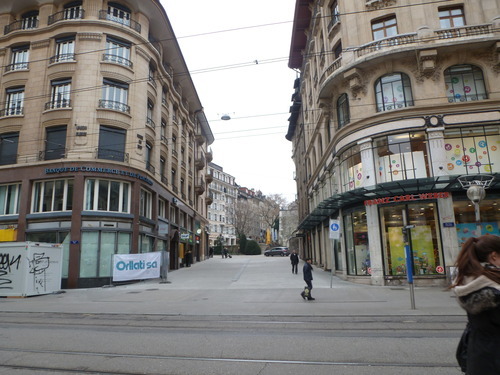 The city center of Geneva reminded me a bit of London with the architecture of the buildings. If anything, it was just very European, and I loved to look around. We walked around a bit, stopping in a few stores. We walked into the Swatch shop, and I entered to win a prize of 2000 Euros. Maybe I’ll get lucky! We also walked into a department store of sorts, and on the bottom level was a really fancy grocery store, with many free samples. I enjoyed a few. Outside of the store, there were little stones with “Hello” written in many languages. 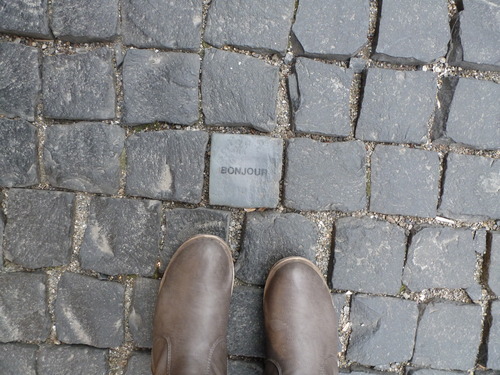 I couldn’t find “Shalom,” so I settled for “Bonjour,” since I’m in the French part of Switzerland. We stopped for lunch at a traditional Italian hole-in-the-wall type place. We all got focaccia bread paninis with some antipasti dishes. It was delicious! Sadly, no pictures. I was too excited that I forgot. We enjoyed our lunch and headed back out into the cold. 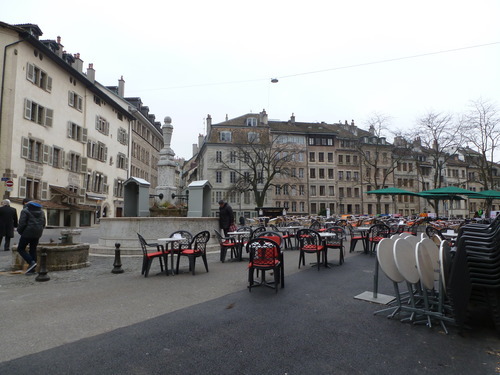 On our way back to the car, we walked through the old city of Geneva. It was absolutely beautiful! But also completely empty, which seemed unexpected on a Saturday afternoon. Deborah informed me that this week is a winter holiday in Switzerland, and that most people choose to go skiing. 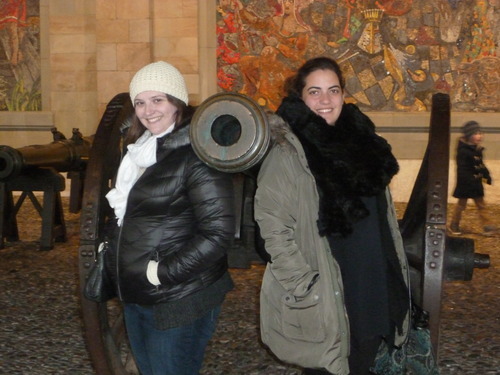 We also found these cool cannons and decided to pose by them, because why not? We headed back to Deborah’s house to rest for a few hours. After a quick nap, we went back into the old city for dinner: traditional cheese fondue! This I actually did take pictures of! Elias taught me the etiquette involved in eating fondue. You need to firmly stick a piece of bread on the fondue fork. If you lose your bread in the fondue, you’re supposed to pay the bill! Then, whoever is the first to dip their bread in swirls it around in the pot in one direction, clockwise or counter-clockwise, and that is the direction everyone must swirl their bread in for the rest of the time. 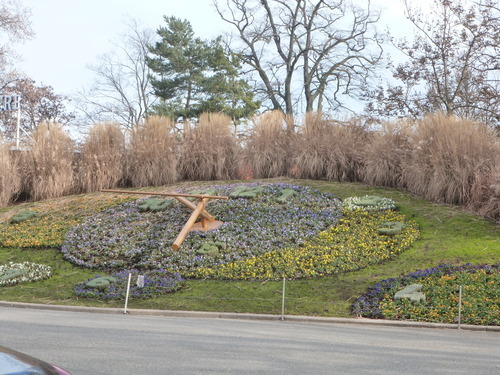 Elias chose clockwise. I easily got the knack for dipping the bread it. You are also supposed to drink either white wine or tea with the fondue, because if you drink cold water, the cheese can solidify inside of your stomach and make it difficult to digest. We went with a dry white Swiss wine, which was nothing special, but paired nicely with the dish. Mom, you probably would have liked it. I thought of you. The fondue was really delicious, but extremely rich. I couldn’t have that much of it, and you all know that I’m a big cheese person. Deborah told me that most Swiss people only eat fondue once or twice a year, and I understand why! It stays with you for a while. 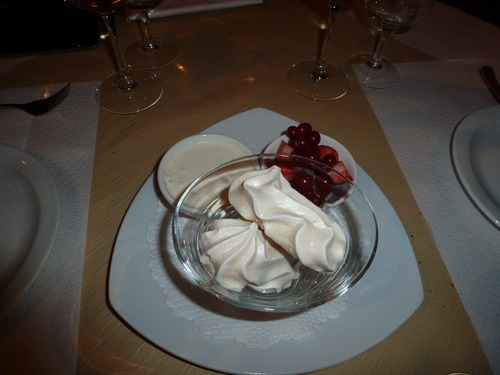 For dessert, we ordered a traditional Swiss meringue with double cream. This is apparently the most Swiss dessert you can get. It was really delicious, but also heavy because of the cream. The meringue was light and sweet, while the double cream was heavy (but unsweetened. I think sweetened would have been overkill). This one was served with some nice berries. It was great! 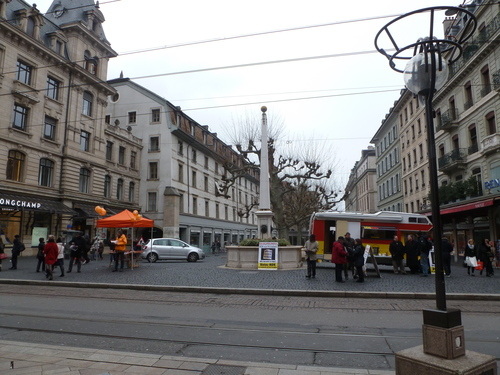 Very simple, and I felt like I had a really Swiss experience. Exactly what I wanted to do! Sadly, I don’t remember everyone’s names, as I met quite a few people later that evening. After our very Swiss dinner, Deborah and I headed over to another restaurant where a friend of hers was having her birthday party. No, I didn’t eat again. I was beyond full from my meal. 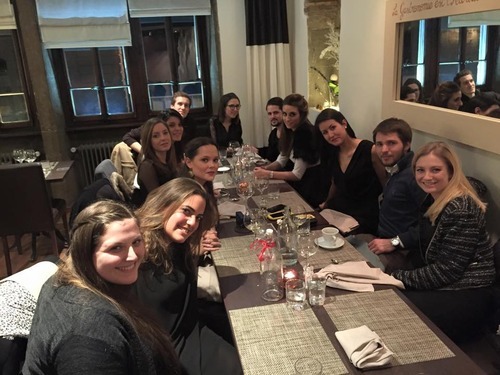 I was introduced to 10 of Deborah’s friends from her university, who, fortunately, all spoke English! They were all very friendly, but it was a bit hard to keep up since they were mostly speaking French. But overall, they were all very welcoming and inclusive. After that, we got in the car and went back to Deborah’s friend’s house from earlier today for a party! You remember, the super massive house I mentioned earlier in this post? Well, now there was an American-themed party, complete with beer pong and red solo cups. I felt like I was back in college, except for the fact that everyone was speaking French! I told Deborah not to worry about me and to mingle with her friends, and I ended up meeting a few nice people who all spoke English very well. I was having a very nice time, but unfortunately the cheese wasn’t sitting very well with me. Deborah was ready to leave, so we headed back to her house and to a well deserved night of sleep. Stay tuned for part 2 of my time in Switzerland! There was an issue with posting, so I broke it up. That’s okay though, because I have quite a bit to say during part 2!